I grew some elephant garlic last year, admittedly by mistake – the bulblets had been left in the ground from the previous year, survived and grew. I love it when “gardening” works for me ! I remember seeing a programme on BBC Iplayer last year (or maybe even the year before, memory is not a strong point here!) where Clarissa Dickson Wright was waxing lyrical about garlic, including elephant garlic and this recipe idea from her stuck in my mind. Fresh, garlicy and well, a tomato with a hat on. Basically we’re talking stuffed tomatoes; the ingredients are breadcrumbs, chopped parsley, chopped prawns and yes a chopped Elephant garlic clove. 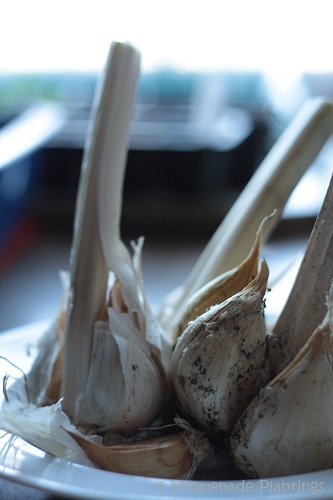 If you don’t have Elephant Garlic, use what you can get locally, I’d just try and make sure it was good quality garlic – nice and fresh not dried and shrivelled. I try and only eat Prawns that are labelled as “sustainably fished” or “responsibly farmed”, mostly I avoid them, but I’m human and the flesh is weak….. I don’t often get on my soap box on my blog (well not all that often…. ), I don’t like to tell people what to do or not to do, I just offer my view from where I am standing, it’s only 1 view amongst billions of people who inhabit this earth. But I could get up on my soap box about sustainable fishing and responsible farming – especially when it comes to prawns. It’s a scary business, polluting and grim. And as much as I love prawns, I know that my love of them comes with a price. As an alternative to prawns for this recipe I’d try crab meat, it’s a delicate and sweet flavour that works well with the garlic and parsley. So for all you Southern Hemisphere people here’ s a great recipe for end of season tomatoes and for the Northern Hemisphere bods, start dreaming – remember this is why you want to grow your own tomatoes?! The recipe is an un-recipe, I didn’t measure, it was all made using what I had to hand. The recipe relies on getting the best tomatoes you can, big and fat and ripe – perfect for late summer when the tomatoes are at their best. Take a large beefsteak type tomato and “chop off it’s head”, carefully scoop the seeds and the gloop out, put the tomatoes in an oven dish with a little bit of olive oil in the bottom to stop them sticking. In a frying pan lightly saute some chopped garlic for a couple of minutes, add a good amount of fresh breadcrumbs and some chopped prawns (or crab), stir and add a large handful of chopped parsley, a sprinkle of salt and pepper and continue cooking for a few minutes. and then remove from the heat. Fill the tomatoes with the prawn mixture, put the tomato hats back on and seal the baking dish with foil. Cook in a medium to high oven for about 40 minutes or until you can smell the tomatoes cooking and when you pierce the skins they are soft. If you don’t want to use fresh breadcrumbs rice works well too. They are perfect as a posh starter or alongside a salad for a main course, they are surprisingly filling. See I said it was an un-recipe – no quantities and no real instructions. But you are all clever cooks so you will make this dish beautifully! If you are wondering why I’m posting this recipe in April, you are right to wonder- it’s been sitting in my drafts for eons and what prompted me was that I need your help and suggestions. Last year’s garlic crop has been eaten, all except for the Elephant Garlic. Now these really are ginormous in size, not strictly a garlic it’s a relative of the leek family, but in flavour it is garlicy, slightly milder but still garlicy. It is delicious roasted alongside potatoes and parsnips – it softens and is sticky and gooey and garlicy. But I’m running out of ideas, which is where you come in. Any bright ideas or recipes out there? I’m sure you have a recipe stashed away ready to share or bright ideas for me to try. How about a slow-roast 30-cloves chicken? You take a chicken, roughly chop 30 cloves of garlic and stuff the chicken with it, both in the cavity and under the skin, maybe you add some slices of lemon or some sprigs of rosemary, and then you smother it in butter, season with salt and pepper and stick it in a covered dish in the oven at low-to-medium heat for 2-3 hours. Remember first to add some liquid to the bottom of the dish, either white wine or just plain water. The long roasting time will “mellow” the garlic taste and make it almost sweet and absolutely delicious. You could also roast perhaps 20 cloves of garlic with 2 aubergines cut in halves, then scoop out the aubergine flesh and mash it with the garlic, seasoning with a touch of olive oil and serving it with a grinding of black pepper on top as a great dip for croutons as a pre-dinner snack. Oh, and finally of course you could fill a roasting tray with garlic, drizzle lots of olive oil on top and roast them for 1-2 hours until tender. Then push the garlic and oil through a sieve with a spoon and put it in sterile jars, topping up with olive oil to ensure the paste is covered. This garlic paste is a great way to add a mild and sweet garlic flavour to any dish or sauce! All those ideas sound great. How long would the garlic paste last? I don’t know, actually, but my guess would be up to a year – though my garlic paste never lasts that long. Just make sure to put the paste in when it’s still hot so it seals the lid when it cools down. After opening you just make sure always to have the paste covered with oil and then it can easily last a month. But those stuffed tomatoes look just like the Yemista I missed out on in the Greek restaurant – yummy idea! And I love your garlic though sadly, I am lacking in any knowledge to help you use use more than a bulb! “Stuffed tom toms” is what I called them when the kids were little and reluctant to try them! Of course the recipe was more basic than your fantastic version! You also taught me something here…I’d never heard of Elephant garlic so did some googling. What a fascinating process! I’m looking at your beautiful allium now! I remember reading that post when I first found your blog!!! Perfect for a grey day like today, and I’ve saved the recipe, I’ve never made garlic soup before so now’s the time !! Here’s to a wonderful world of amuse bouche 🙂 and thanks for the suggestion! This sounds like a great summer recipe. It really is Karen, and very simple and can be prepared ahead of time too ! 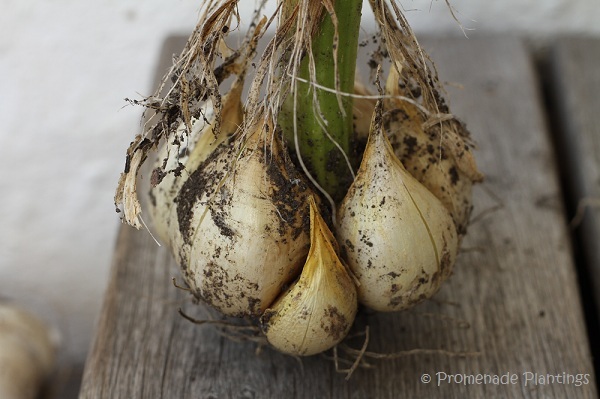 Never worked with elephant garlic, so I’m no help on that front, but I had to laugh at their ‘left-over’ provenance…I tossed some seedheads from my hardneck garlic in an unused spot a couple of years ago, and there’s a Garlic Forest there this spring. Can’t wait to dig them up! Grain would be a great substitution Marie, I’ll borrow that idea! I think the best gardeners (you and I of course….. ) have “left overs” all the time, the worst one for me on the allotment are the potatoes I miss and then they stay in the ground, sprout the following year and always in random places!!! 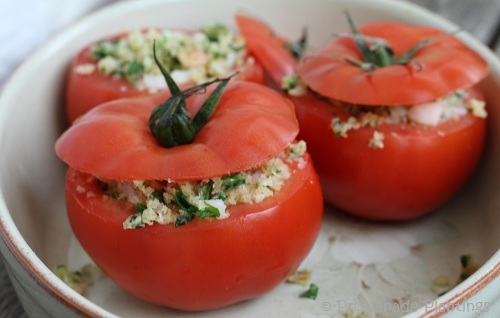 I love stuffed tomatoes…these sound especially wonderful. I went to a garlic party a few years ago where we each brought a dish, and each had to use at least a whole garlic bulb. I made a mild, simmery garlic soup from the Moosewood Cookbook. Someone brought garlic ice cream! Good luck! the ice cream was surprisingly good! The garlic was slow roasted to bring out the sweetness…it definitely tasted garlic-y, but it was okay. Not something I’d want to keep a gallon around of, for midnight indulgence…but okay. Elephant garlic I have only seen once .. at the public market. Love you photos of them. I came across smoked garlic in Cork, loved it ever since. Smoked garlic is an amazing thing, I’ve seen it in France a fair bit, delicate and sweet and well smoky! Lasts for ages too! Here here…I like it when you get on your soap box! I too was going to suggest the garlic paste and as you’re not a meat eater, how about doing the chicken thing but stuffing a couple of small squash instead. Or you could make some pickled garlic? Or go to Bexhill Farmers Market (every Friday morning!) on your bicycle wearing a beret and a stripy top and pretend you’ve popped over from across the channel to share your delicious garlic with us! Now as to the Bexhill farmers market – I wear hats, I do own a bike, it needs some work on it, I own a stripy top….. I love prawns as well but it is so hard to find ones that are wild and not farmed. So I rarely have them. The garlic looks amazing. I keep meaning to give garlic another go in the garden. Wild ones are rarer than en’s teeth around here! Unless you like the teeny shrimp that are fished locally – lovely but very fiddly, nice flavour though! I’d recommend growing garlic, the flavour really can’t be beaten! One drawback is that it’s in the ground for ages, but on the upside it’s in the ground over winter when not a lot else is. You could also chop up a bunch of the garlic, add canned (or boiled) oyster mushrooms, cover in a marinade (1 to 2 vinegar and olive oil works) and put in fridge in tupperware for three days. Take out, put fresh herbs on top, and eat. Yum. Now that sounds like a superb combination, thank you ! I knew my blogging buddies would inspire me ! What perfect looking tomatoes! Yum! Claire, you are one of the few people I know who grows their own vegetables and doesn’t make the the rest of us feel like scum for not doing so. So you have every right to express your opinions about the benefits of ethical seafood! And that elephant garlic looks gorgeous! With garlic, the bigger, the better. I love smashing a large clove or grating it into pasta or sauces! The hatted tomatoes look wonderful. You really can’t go wrong with garlic, olive oil and prawns. Best stuffing! 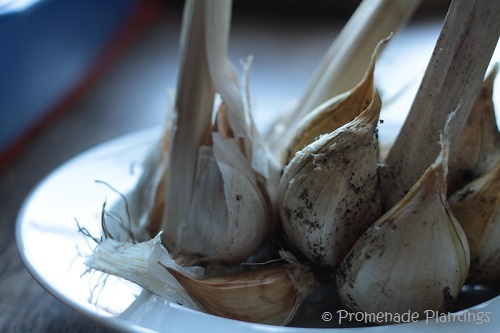 We love garlic too – wish I had some elephant garlic like yours! When I’m feeling tired (or lazy!) we have spaghetti with garlic very lightly sautéed in olive oil. Add salt and pepper, and serve with grated parmesan on top – deelish! Your stuffed tomatoes sound wonderful, Claire, and would make a perfect starter or light lunch come Summer. I wish I had a solution for your garlic problem but a) I’ve never tried or used elephant garlic and, b) I cannot accept the idea that one can have too much garlic. It just isn’t possible. I think an occasional soap box moment is fine. Ranting is probably what we avoid, but a good encouragement to think twice is always welcome. Your tomatoes with hats on looks wonderful, Claire. I can’t wait for fresh tomatoes…you’ve got me salivating and I have a way to go before they’ll be ready. 🙂 Your garlic is beautiful!! A very good recipe for summer and I’m betting lobster will work, too. There’s nothing wrong with preaching about sustainability considering how many species of seafood are gone or endangered. Oh my Lobster I’m sure would be amazing, and of course you get such great fresh Lobster in summer! I remember eating the most gorgeous leg of lamb studded with garlic cloves and chunks of parmesan years ago and think that could be a good solution. That sounds mouth wateringly good! Such pretty tomatoes with “hats”…all red and juicy and so stylish looking! Great recipe for stuffed tomatoes, but as far as the elephant garlic goes I am at somewhat of a loss. Roasted with vegs, roasted and them smashed and smeared on toast, thinly sliced and sauteed with spinach or kale? So many ideas but I have not elephant garlic! You’ve had a lot of great suggestions for using your garlic, Claire. The only one I might add is that garlic in chili, vegetarian or otherwise, is one of my favorite ways to use it. I usually put about 10 cloves in my chili and cook it down with the veggies. It mellows as the chili cooks, and I also always use garlic when cooking greens of any type. These stuffed tomatoes look divine, and I think crabmeat in them would be spectacular. Mellow chilies are just the best, I dont think you can beat roasted!